My best friend and I had been shopping; a wedding dress for her and a bridesmaid's dress for me. My friend was slim, blonde, blue-eyed and very pretty. She wanted a purple-blue theme for the wedding. It was her day so I went along with her choices. But a little part of me died that day. I had a horrid feeling that the electric blue satin dress my friend had picked out for me was going to make me look like an inflatable giant blueberry. In fact I knew it would, so by the time we arrived home at her parents' house I was feeling somewhat despondent. Her father greeted us cheerfully with the news that since we had had such a tiring day he had made us a light supper, adding that he didn't know why we had bothered looking at bridesmaids' dresses when we could just hire another marquee for me to wear . . . which was why he had made us a salad. I was crushed. I barely know the man and he had just told me that I was fat. And not just a little bit curvy but of massive, tent-like proportions. I was fully prepared to sulk and viewed the salad with some resentment. My friend eyed the salad with a baffled look. "It's very pretty," she said, "but it looks just like a flower arrangement." "It's a nasturtium salad," he said. "Very popular in Victorian times. And since your bridesmaid loves History so much, I thought it appropriate." This frankly, left me a bit baffled too. Not that I don't love History, I do. I just wasn't sure what this had to do with supper. 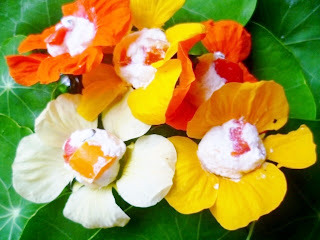 My friend's father had stuffed some of the nasturtium flowers with a mixture of roasted vegetables and cream cheese; he'd stuffed some of the leaves with a devilled crab mixture. My sullen attitude changed once I had tasted the stuffed flowers. They were delicious. I don't suppose there is much point in holding a grudge for 20-odd years, since the supper was rather lovely (if not very filling for my gargantuan, marquee-sized appetite). So this summer has finally ended with a splutter and a damp squib, but my nasturtium flowers are still waving brightly across my back garden. I reaped the colourful flower harvest, made my own labneh cheese (such fun! ), and stuffed the flowers to make party nibbles. I haven't got around to working out the devilled crab filling, so perhaps that's a recipe next year! If you are making your own cheese, it is as easy as taking a 500ml tub of natural yogurt and stirring through half a teaspoon of salt. Line a sieve (over a bowl) with 2 clean J-cloths or one of those old-fashioned cotton dish cloths and spoon in the yogurt. Leave in the fridge for 3 hours or so and the liquid will drain out of the yogurt into the bowl. You will be left with about 100g of thick white substance which is essentially cream cheese. That simple! I tend to give the cheese a helping hand by squeezing it a few times and sometimes I have to leave it overnight to drain. But the end result is always perfect. While it doesn't have a lot of flavour, it is creamy and tangy; perfect for cooking. Firstly prepare the aubergines, by brushing each side with a little olive oil and grilling until very lightly coloured on each side. Set aside to cool. Add 1 tablespoon of olive oil to a frying pan and tip in the chopped shallots. Sprinkle over a pinch of salt and fry the shallots for at least 5 minutes (if not longer) until beginning to soften. Add the garlic and fry for 2 minutes, before adding the chopped courgette and peppers. Fry for 2 minutes, without letting them brown, before putting a lid on the pan, reducing the heat and allowing the vegetables to cook for a further 5 minutes. Chop the aubergines and add to the mixture. Add the lemon juice and bring the heat up to reduce any liquid but without burning the vegetables. Check the seasoning while the vegetables are warm. I like to add lots of freshly ground black pepper. Set aside to cool before draining the vegetables if necessary. Add the finely chopped herbs. Combine the vegetables with the cream cheese. Roll out small balls about the size of a small thumbnail and leave in the fridge to firm up. 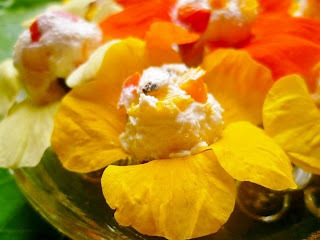 Shake the nasturtium flowers to make sure there are no bugs, and then press a ball of cheese into the centre of each flower. oh dear, people can be so hurtful and Brides can be very tactless in their choices too. The Nasturtium flower salad on the other hand is fantastic, so pretty and colourful, pity the wedding couldn't be themed around the nasturtiums! Never mind the tent. One of the nicest kindest most gorgeous women I have ever known wore - by her own description - tents. Not that she was tented by design - something to do with that little joker (thyroid)playing mischief. Nasturtiums. I am sure they are great on the plate. Indeed, I have stuffed my homegrown courgette flowers. However, my nasturtiums a blackfly magnet if ever there was one. Upsetting. Not only spoiling one's appetite, just looking at those lovely flowers not aesthetically pleasing. You make your own Labneh? Same here. Not that I am ambitious. Remind me to tell you of a time when my sour dough starter took over the house. Hey ! Thanks for the recipe!! I will try it soon! Love this idea! Now I've just got to snaffle some nasturtiums from other halfs mother.